Author: Sigrid Schmidt. Series edited by: Rainer Voßen. 10 pp. Roman, 251 pp. The present study focuses on the texts which Wilhelm Bleek and his sister-in-law Lucy Lloyd wrote down from dictations of Bushman prisoners in Cape Town between 1870 and 1884. This collection of nearly 13,000 pages has been published only in parts. It has only come to light over the course of the last decades how valuable this unique collection is as a source for further study of the spiritual world of a culture which has meanwhile disappeared. Researchers of various fields devoted studies to it, particularly to the tales. These tales were interpreted on the basis of the general |Xam material and a few further Bushman sources. This investigation treats the texts for the first time within the framework of the general Khoisan folklore and compares more than 40 individual tales with related traditions of other Khoisan peoples, occasionally also with those of Bantu neighbours. As a rule, the comparison goes beyond a mere comparison of motifs. Basic questions of style and form of folktales, also in relation to international folklore, are discussed as well as the individual style of the three main |Xam narrators. In this way new insights into the trickster stories and the character of the trickster are gained. Accordingly, the well-known |Xam trickster |Kaggen cannot be viewed as a prototype of Khoisan tricksters. Special emphasis has been given to the investigation of the ancient magic tales of the Bushmen whose character had not been understood because they were treated merely as animal stories. A concluding chapter examines the roles of men, women and children as heroes of tales. 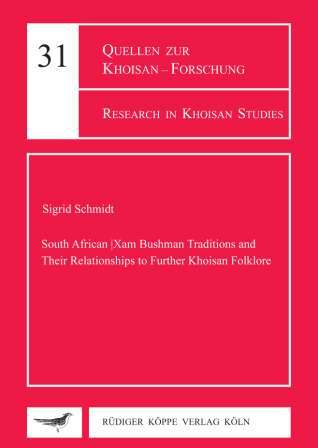 Sigrid Schmidt has already made an immense contribution to folklore and San Studies in three major areas. She has collected Nama and Damara narrative and other oral material in the field, beginning in the 1960s, and has translated and published collections of this material in English and German. The sheer volume and quality of this material, often accompanied by trenchant commentaries, testifies to decades of meticulous field work and research. Secondly, she has worked tirelessly to classify the extensive oral literature of what we might broadly call the Khoi and the San traditions of southern Africa into genres such as magic tales, trickster tales and legends. If this were not enough, she has also provided a comparative framework for a study of southern African folklore by cross- referencing variants of stories from within traditions and across traditions. This framework is often extended to include stories from outside the Khoisan linguistic and cultural sphere, recognising the millennia of interaction between the people of southern Africa, across a time period that reaches to the present, and between these people and people from Europe and Asia. South African /Xam Bushman Traditions and Their Relationships to Further Khoisan Folklore contributes to both the classification of Khoisan oral literature by type and to the comparative framework so exhaustively pursued in her earlier Catalogue, "an inventory of all published and unpublished Khoisan tales" (Schmidt 2013, 21). The book will be a valuable tool for scholars, giving them a useful key to com- parative work, both in the way that it cross-references stories and links them to the scholarly work that has been produced in relation to them. It probably provides the most comprehensive overview of the /Xam narratives yet available, apart from actually reading through the notebooks themselves, and this is linked to a wealth of other stories from across the region. The stories themselves are told in a lively manner. The book could, thus, be enjoyed by a general reader as well as by scholars. [...] the author is to be congratulated on making yet another invaluable contribution to scholarship in this field. I expect this book to become essential reading for anyone working on Khoisan folklore and folklore in general. Not only does the book make a direct contribution to the field, but like the Catalogue, it will facilitate the work of other scholars. Complementing and supplementing /Xam scholarship, Schmidt’s admirable book is a superb contribution to the field of Khoisan studies.